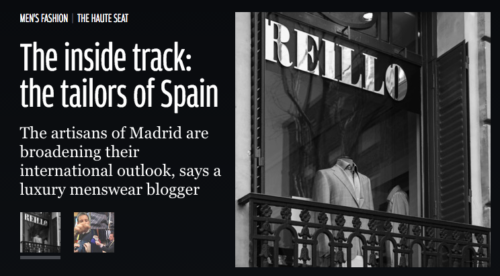 In the past year or so, having got to know a few of the Spanish tailors a lot better – and having had things made by them – I have become very fond of their attitude, their openness and approach to catering to more international clients. Hopefully that comes across in my latest column for How to Spend It, the luxury supplement of the Financial Times. You can read all previous articles, including practical tips on how to buy quality in everything from suits to bags, here. 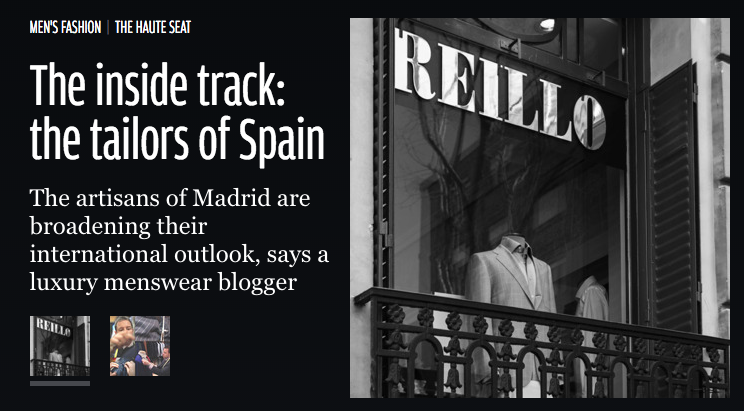 You can follow the discussion on Spanish tailors in How to Spend It by entering your email address in the box below. You will then receive an email every time a new comment is added. These will also contain a link to a page where you can stop the alerts, and remove all of your related data from the site. The Midnight Blue Dinner Jacket Question. I am about to commission a new dinner jacket, trousers and waistcoat and I am tempted to go for midnight. On the one hand, and as I think you have commented in previous posts, I think blue is simply more flattering than black to someone like me with a pallid British complexion. On the other hand, does midnight risk being faddish or showy? Whilst midnight seems to have been popular of late, (most RTW names seem to have midnight offerings at present it) my tailor reassures me that midnight has been used alongside black since Henry Poole first created the short coat for the then Prince of Wales, he has even speculated that this first dinner jacket could itself have been midnight. If I were to take the midnight route, I would go for midnight grosgrain facings on the lapels rather than black (as I often see) as I think the black lapels really highlight the midnight as blue. I think keeping the whole lot midnight is a little more subtle. PS. I know a dinner jacket ‘should’ have no vents, but do you think a double vent ought to be considered – I think it would hang better but is it less formal? I love the idea of lapels shrinking or growing 1/4 of an inch each decade. Such a great example of the subtlety in classic menswear styles.